You get the entire Prejudging phase of the Arnold Classic, including the solo compulsory poses of every athlete, the relaxed symmetry comparisons and the dynamic muscularity round comparisons. Plus, as an added bonus, a special tribute to 8-time Mr. Olympia LEE HANEY. Lee joins journalist Dave Bontempo and bodybuilding legend Vince Taylor in a discussion of the posing routines and athletes in the Finals, and on-stage receives the Arnold Classic Lifetime Achievement Award – almost 20 minutes of special footage not to be missed. Please click here for the 2006 Arnold Classic Finals, A-1131DVD. Now only sold as a 2 DVD SET, A-1132DVD. Most Muscular Award went to Branch Warren, and the Best Poser Award went to Melvin Anthony. Originally slated to compete, but dropped out weeks before the show was Chris Cormier, Dennis James (throat surgery), and Mark Dugdale (stomach flu). Dexter Jackson swept to his second consecutive Arnold Classic win with a straight firsts victory that seemed a little generous. Breakthrough athlete of the event was Branch Warren who also won the most muscular award. Third was Victor Martinez, with pre-contest favorite (with Jackson) Gustavo Badell adjudged fourth - an announcement that cause a boofest. In truth not one of the top four - save Warren - were in their best shape, and some who were -- for example Darrem Charles and Toney Freeman -- maybe can be thought unfortunate with their placings. Best poser award went to Melvin Anthony. Prejudging reportThe 2006 Arnold Classic is shaping up as one of the most difficult to figure out in recent years. Usually the judges will give a clue to where they are headed with a final two-man callout. This time around the final callouts revolved around the lower placings, but it seems clear the top four (for the time being in alphabetical order) will be, Gustavo Badell, Dexter Jackson, Victor Martinez and Branch Warren. Kudos to the IFBB panel on creating this "Who will it be?" scenario and for mixing up all the comparisons so that every competitor just about got to flex with everyone else. At the start of prejudging Gustavo looked a tad off his third place 2005 Olympia finish and seemed to have to fight a little to control his midsection. Defending champ, Jackson, after a year away from competition looked.....well, like Dexter Jackson; which is a hell of a package, but around the midsection he didn't seem quite right. Martinez must get sick of everybody saying it, but he wasn't in the winning condition he was at the 2003 Night of Champions or the 2004 Show of Strength. Bigger, yes, with hanging lats etc. but not as sharp as we've seen. Branch Warren caught the eye early with his monstrous mass and great condition. His symmetry is fast improving and with a little more work on some of his poses he'll be even more formidable. As said earlier it is a tough one to call. Dexter seemed to fade as the prejudging wore on; possibly a consequence of collapsing to the floor backstage after the first round and asking for oxygen. Traveling in the opposite direction Badell (as he has done at previous contests) seemed to get harder and drier. And that may be his winning card. But maybe the dark horse is Warren. Of the top four he is the only one who could realistically claim to have brought his best-ever package to the stage. Maybe, just maybe, that will count in his favor big time. Other random thoughts: Darrem Charles deserved a chance to get in among the previously mentioned top four; David Henry was not as sharp as he was at the Ironman and paid the price; Lee Priest failed to build on the momentum of his Ironman win as he came up against guys who were just more complete; Troy Alves dropped a bunch of weight to try and bring in his hams and glutes and still it wasn't considered good enough; Melvin Anthony was heavier and maybe as sharp as he's ever been but couldn't combat the ultra-sharpness of the top four; Toney Freeman - I keep looking at his physique and thinking, Just what is wrong with it that he doesn't get higher callouts? Chris Cook still has to build thickness and detail in the pecs and back; Ahmad Haidar got lost in the overall shuffle; Mustafa Mohammad was sharper than at the Ironman where he got sixth, but may have to fight here to get in the top eight; Kris Dim seemed a bit flatter than his Ironman showing, and can do much better; Johnnie Jackson wasn't at his peak best and so seems destined for a minor placing. 2006 Arnold Classic competitor list : Chris Cook, Ahmad Haidar, Branch Warren, Mustafa Mohammad, Melvin Anthony, Dexter Jackson, Kris Dim, Toney Freeman, Troy Alves1, Darrem Charles, David Henry, Lee Priest, Victor Martinez, Gustavo Badell, Johnnie Jackson. Special thanks to Flex Magazine and Team Flex for the use of this article on our site. 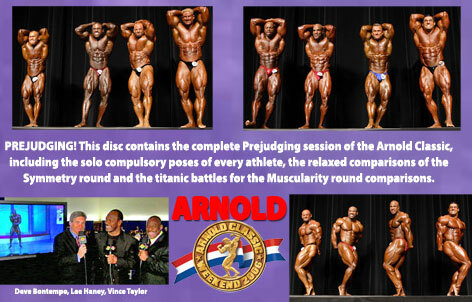 GMV also produced the DVD of the 2006 Arnold Classic pump room. To order that GMV-631DVD, please click here.